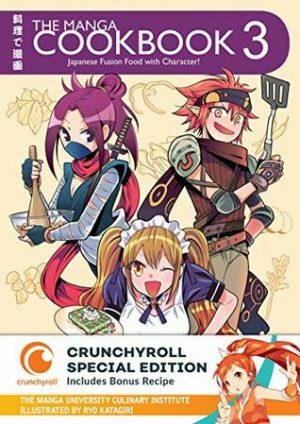 #MangaMonday – The Manga Cookbook Vol. 3: Fusion Food With Character! This is a bit of a different review than most Mondays, though it is still manga related. I had my eye on this series of books for quite some time, but I hadn’t stumbled across any in my bookshop travels. Well, one of my friends came across a copy of The Manga Cookbook Vol 3: Fusion Food With Character! at Comic-Con and got me a copy! The Manga Cookbook Vol. 3: Fusion Food With Character is a manga styled cookbook filled with recipes for fusion dishes. Each recipe comes with a two page introduction with a manga character and a short, one-page manga featuring that character. This was a fun addition for a manga themed cookbook. The recipes themselves all look fantastic. There is a very wide variety of foods here. Meat dishes, drinks, appetizers/snacks, desserts. There is a little bit of everything in here, fit for every palate. None of the recipes have too many ingredients – five to six seem to be the high end of most of the ingredients lists. Most importantly, none of the recipes are overly complicated. This is important because while I may not be a terrible cook, I am certainly a distracted one. Even with timers, I’m not always good about taking things out of the oven at the right time and complicated recipes tend to end in heartbreak for me. While looking through this volume, though, I didn’t feel overwhelmed out of my depth at all. There are several dishes I plan on making. I don’t have quite as much to say here as I normally do as this is, well, a cookbook. But it is something I wanted to draw attention to, as it is fairly unique and I enjoyed reading through it and picking out some recipes to try soon. Do you know of any other recipe themed cookbooks? Let us know in the comments! If you love manga or are interested in cooking, I’d absolutely recommend taking a look at The Manga Cookbook Vol 3: Fusion Food With Character. It’s fun, it’s cute, and the recipes look really good.